Sean Prentiss takes readers across the country as he gathers clues from his research, travel, and interviews with some of Abbey’s closest friends—including Jack Loeffler, Ken “Seldom Seen” Sleight, David Petersen, and Doug Peacock. 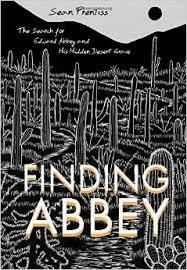 Along the way, Prentiss examines his own sense of rootlessness as he attempts to unravel Abbey’s complicated legacy, raising larger questions about the meaning of place and home. Order a copy of this 2016 Colorado Book Award Finalist book here.